John sat down at his computer and pulled up the master brainstorm list he and his team had generated at Tuesday's afternoon meeting. He scanned the list and sighed as feelings of overwhelm slowly built within his chest. There had to have been at least 30 items on the list. His eyes jumped back up to the title, written in all caps and bold, at the top of the screen: "HOW TO IMPROVE OUR WEBSITE RESULTS." How in the world was he supposed to prioritize the suggestions on this list? Would making any of these changes actually move the dial for his business? Should he have reached out to his marketing consultant instead of gathering ideas from his team? Should he implement these changes over time or make them all at once? As John read through the list one more time, he came to a decision. "I'm pretty good at putting myself in other people's shoes," he thought. "After all, that's a pretty key strength that's helped me grow the business so much over the past 3 years." So John decided to imagine what it was like to be a new visitor to his company's website and, using this imagined objectivity as a guide, proceeded to rearrange the brainstormed ideas into a prioritized list of website to-dos. Don't do what John did. The main challenge businesses have when improving their websites is figuring how to determine what's actually important. While businesses rarely run out of ideas and opinions, business often struggle to focus on the most important things in their websites—the vital, few changes that will actually move the needle when it comes to website success. John has run into this challenge and is handling it in the wrong manner. He's making the biggest mistake companies make when it comes to trying to improve a website's performance and results: He's making decisions based on personal opinions, not real data. the latest blog that contained some rehashed top-ten list of recommendations "all business websites MUST HAVE". Making decisions about how to improve your website based on one of these three things is just rolling the dice. Smart businesses don't rely on luck. They don't want to guess. So how do smart businesses know which changes will make the biggest impacts on their websites? They do what their visitors tell them to do. User testing is a fantastic way to collect objective feedback about what's working on your site and what isn't. The challenge with user testing is that it's not always easy to conduct it on actual members of your exact target audience. The easiest way to collect objective feedback from your target audience about your website (to learn what needs to be improved) is to simply ask your audience. 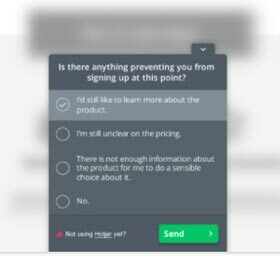 Our conversion rate optimization expert, Nicolas, shares that a simple pop-up survey box (something you can get running on your site quickly using a service like Hotjar) that asks the right question will do the trick. Nicolas recommends asking open-ended questions that allow your visitors to speak freely; this often translates into information that's more valuable and easier to transform into decisions about what changes to make to your site. If there's one seed we'd like to plant for you today, it's this: Stop wasting your time making little tweaks here and there to your site because you or someone at your company think it might be a good idea. You'll invest resources and, when you're done, you'll have no idea whether it was worth it or not. Instead, consider getting serious about making changes to your site based on data. And not just any data, but real data coming from real visitors to your website. The changes you make based on real user data are the changes that will move the needle and generate the significant results your business is hoping for. To learn the nuances of collecting the right data (including which questions to ask, how long to gather data for, and how you should know what to focus on), contact us today to learn if a consultation with Nicolas is the next step in website improvement you've been looking for.